These should sit for about 1 week to develop full marinated flavour. Words well spoken by a saint in every sense of the word… but back to artichokes. All of us have done it. We’ve been shopping in the grocery store and looked longingly at the artichokes and maybe even picked one up. But one touch of that alien of a vegetable and we put it back down and walk away. They have every appearance of being trouble. They’re weird, to say the least. They’re also delicious, and believe it or not, very easy to deal with. Can you peel a carrot or cut up a turnip? If so, you’ve got all the skills you need to prepare artichokes. I was lucky. A few days ago I was scanning the 50% off fruits and vegetables at Pete's Frootique and came across two containers of small artichokes for 99¢ each. Now before you say “yuck” remember that many of those vegetables have been just placed there and if you use them that day there’s absolutely nothing wrong with them. Just make sure that what you buy is still fresh. 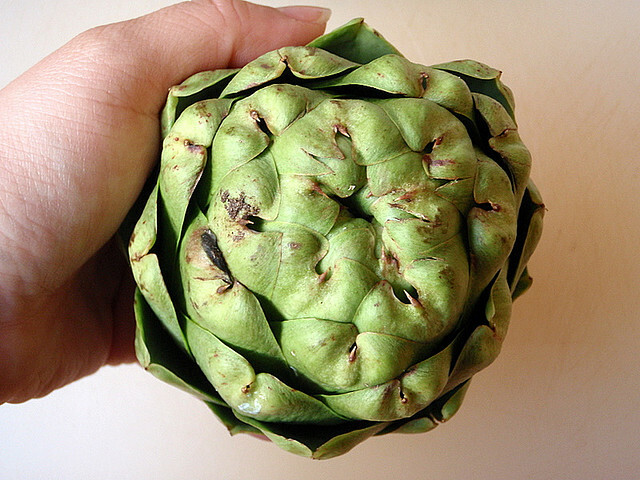 To tell if an artichoke is still fresh, squeeze it. The green "leaves" should make a distinct scrunchy sound as they rub together. When they get old they soften and the sound reduces. The globe artichoke (Cynara scolymus) is a perennial of the thistle family, which itself is part of the aster/daisy/sunflower family. It is believed they originated in North Africa where uncultivated plants can still be found growing wild. 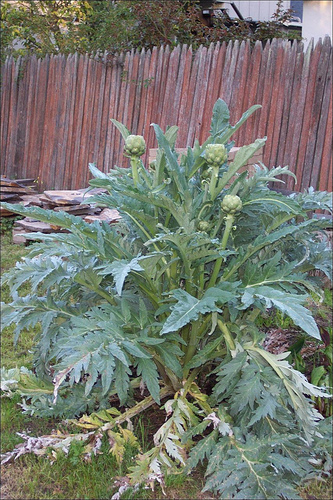 Artichokes are not a small plant, growing to about 6’ high by 4’ wide. The vegetable we eat is actually the flower bud. If allowed to open the thistle-like blossoms measure up to 7” across and are a gorgepus violet-blue color. Peak season is in the spring and fall. Although there are more than 140 varieties, less than 40 are grown commercially. Most commercial artichokes come from France, Italy, and Spain, except for those sold in the United States. California supplies nearly the entire nation. In case you were wondering, baby artichokes are not a separate variety but just smaller versions of larger artichokes. The smaller size comes from their lower location on the plant. Since they are shaded by the leaves, they do not reach full size. Artichokes were cultivated in Sicily since the time of the Greeks. Roman excavations have also found evidence of their consumption, so culinary use in the Mediterranean is at least 2,500 years old. The Roman name for this plant was cardus. The cardoon is still a variety grown today. It is usually grown as an ornamental garden plant (which can be eaten), but not commercially because breeding has improved the yield in other plants that makes those varieties more cost effective. The Dutch introduced artichokes to England in the 1400s, and none other than Henry VIII (as famous for his gourmandism as his wives) had them growing in his gardens at New Hall, a palace he had bought from his in-laws, the Boleyns. In the New World, the French brought them to Louisiana and the Spanish to California, where they have – pardon the pun – taken root as an important cash crop. The next time you see them, on sale or not, you should pick a few up. This recipe is for marinating in oil and vinegar, but they are excellent sautéed, roasted, deep fried, baked, etc.. Artichokes actually have a wide range of culinary uses. If you do find some on sale, marinating is an excellent way to buy in bulk and save them for long-term use. 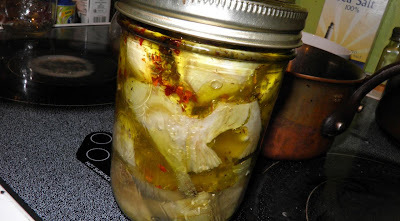 It takes no time at all to clean an artichoke and very little time to marinate. They should sit for one week to reach peak flavour. These are my artichokes just after blanching and draining. 500 ml jar, but they did. Prepare a lemon/water bath to hold the hearts after you clean them. 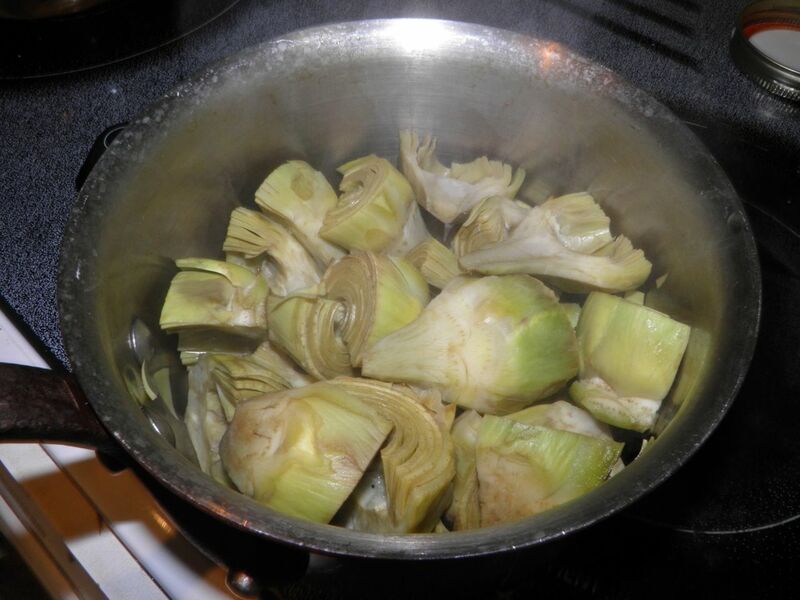 Clean the artichokes, cut in half and place in the lemon water to prevent browning. After all have been cleaned blanch for 10 minutes in the lemon water to which the salt has been added. Pack in a 500 ml jar. Combine vinegar and oil and bring to a boil. 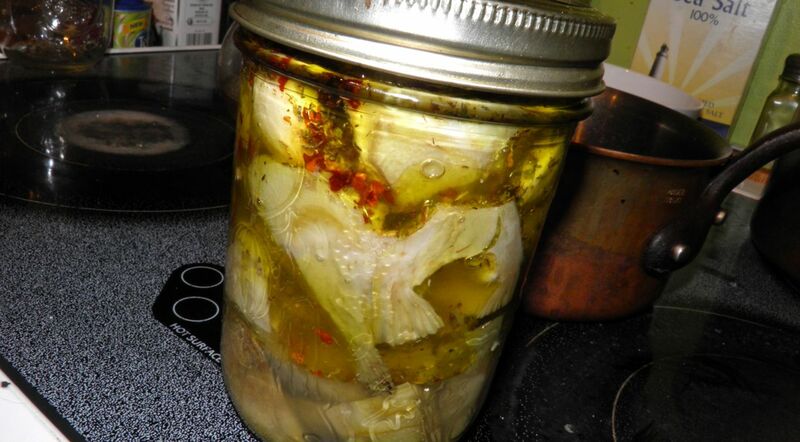 Place the salt, thyme, oregano, bay leaf and chilli flakes in the jar with the artichoke hearts. Pour the boiling vinegar/oil over the top and seal. Refrigerate, just to be safe. Hi, drain the artichokes. The only liquid that goes in is the vinegar/oil, plus the spices. The lemon water is just to prevent oxidization. Thanks for the clarification. I'm really looking forward to trying this! I'll be on the lookout for some artichokes!